We may be getting used to the idea that senior Tory Eurosceptics seem to be woefully ignorant of all the legal complexities involved in extricating us from the EU, writes Booker in his latest column. Rather more surprising, he says, is the blatant disregard being shown for EU law by no less a figure than Commission President Jean-Claude Juncker. On 27 July, he announced that he had personally appointed Michel Barnier, a former commissioner for the internal market, to be "Chief Negotiator in charge of the Preparation and Conduct of the Negotiations with the United Kingdom under Article 50 of the Treaty on European Union (TEU). They do like their initial capital letters in Brussels. 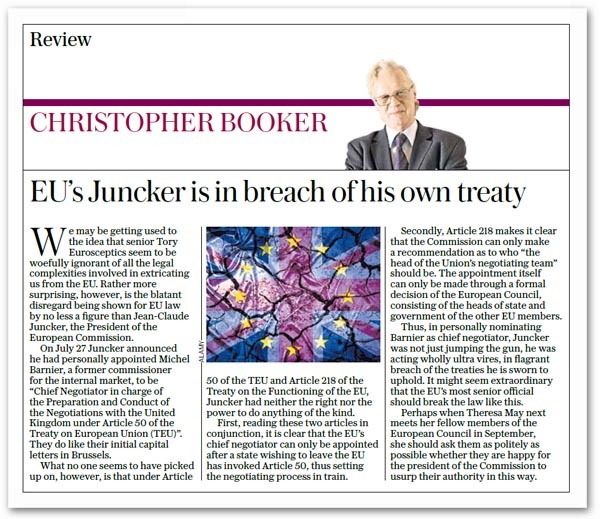 What no one seems to have picked up on, Booker adds, is that under Article 50 of the TEU and Article 218 of the Treaty on the Functioning of the EU, Juncker had neither the right nor the power to do anything of the kind. Firstly, reading these two articles in conjunction, it is clear that the EU's chief negotiator can only be appointed after a state wishing to leave the EU has invoked Article 50, thus setting the negotiating process in train. Secondly, Article 218 makes it clear that the Commission can only make a recommendation as to who "the head of the Union's negotiating team" should be. The appointment itself can only be made through a formal decision of the European Council, consisting of the heads of state and government of the other EU members. Thus, in personally nominating Barnier as chief negotiator, Juncker was not just jumping the gun, he was acting wholly ultra vires, in flagrant breach of the treaties he is sworn to uphold. It might seem extraordinary that the EU's most senior official should break the law like this, although it is not that uncommon for the EU to breach its own law when it suits it. The real question is what Theresa May should do about it. When she next meets her fellow members of the European Council in September, Booker suggests, she should ask them as politely as possible whether they are happy for the President of the Commission to usurp their authority in this way. Oddly enough, the European Council should already be aware of the problem. In its statement following the informal meeting of 29 June – to which Mr Cameron wasn't invited - we see a reference to Article 50 forming the legal basis for the withdrawal of the UK from the EU. "It is up to the British government to notify the European Council of the UK's intention to withdraw from the Union", the statement then says, with the additional comments that: "This should be done as quickly as possible. There can be no negotiations of any kind before this notification has taken place". Then, tellingly, the statement says: "Once the notification has been received, the European Council will adopt guidelines for the negotiations of an agreement with the UK". This is a reference to Article 218 (TFEU) which is clearly seen to be dependent on the notification from the UK having been received. Certainly, the Council needs to take some action. In theory, one could argue, if negotiations are allowed to go ahead on the current basis, with M. Barnier leading the team, they could be deemed invalid and the outcome void. Handled properly, though, M. Juncker's action could give Mrs May the edge. She will be under enormous pressure to obey the Treaties, with the "colleagues" quick to impose "punishments" for real or imagined breaches. To have an example of the Commission being in breach of the Treaties could provide valuable leverage. The one thing this relatively minor infraction can't do though is legitimise any breach of the Treaties by the UK. That's not the way the system, works – we're not dealing with the school playground here. But there is a delicious thought that the UK could refer the Commission to the ECJ for a judgement on the breach, then to have Mr Juncker forced into a humiliating climbdown, with the procedure having to be repeated, so that it can be done properly. If nothing else, that should give the UK negotiating team the moral high ground, unbalancing the colleagues. And, in negotiations of this kind, that is an advantage not to be sneezed at.